Eddie Monteiro Trio: has over 30 years of musical performance in classical, jazz, dance, theater, cabaret and choral ensembles. One of my favorite Jazz Accordionists of all times. The fisrt CD that Frank Marocco played for me, it was Eddie Monteiro CD, I felt in love with his music instantly. Watch the video bellow and listen to what groove is. Accordionist – composer Simone Baron – Arco Belo has headlined at the West Virginia Jazz Festival, Gallery O and Twins Jazz, and performs, arranges and composes for her project Arco Belo, a sextet of strings, bass, percussion and accordion/piano. Recently an artist in residence at the Banff Arts Centre, Simone is looking forward to her upcoming 2016-2017 residency at the Strathmore. awningGuy Klucevsek: is one of the world’s most versatile and highly-respected accordionists. He has performed and/or recorded with Laurie Anderson, Bang On a Can, Brave Combo, Anthony Braxton, Anthony Coleman, Dave Douglas, Bill Frisell, Rahim al Haj, Robin Holcomb, Kepa Junkera, the Kronos Quartet, Natalie Merchant, Present Music, Relâche, Zeitgeist, and John Zorn. Klucevsek has released over 20 recordings as soloist/leader. Grammy Winner Victor Prieto is hailed by The New York Times as “A fiendishly skilled accordionist and composer” and by The All About Jazz as “One of the best World music and Jazz accordionists now days”. An accordionist, composer and educator that has changed and influenced a whole new generation of accordionists and musicians all over the world. 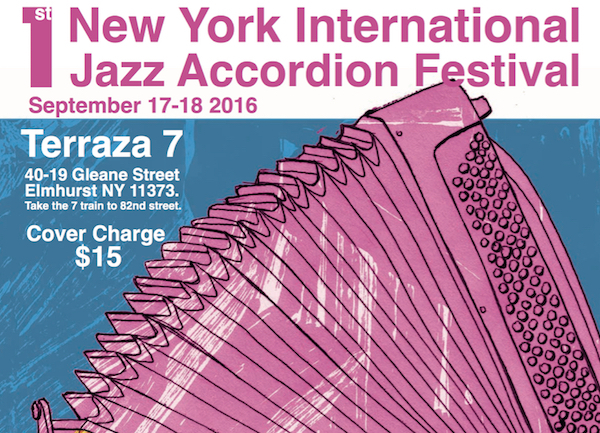 No Replies to "1st New York International Jazz Accordion Festival"